Rockstar may have just debuted what could be an on-going format for weekly events, with a wider theme spanning multiple Adversary Modes and providing double payouts. There’s also a new car added to the game, as always, and finally its something unlike the usual offering of either a retro vehicle or an overpriced hypercar. The discounts this week correlate with the double rewards theme, with a focus on the offensive. The new ride is a 4×4 utility vehicle going by the name Canis Kamacho. This car is refreshing to see pretty much in every way. I’m not even sure we ever got a 4×4 with one of these weekly micro-DLCs, but considering how many there have been, I might be wrong on that count. The Kamacho is mainly based on the Jeep Crew Chief 715 Concept, lending the typical archetypal 4×4 a more futuristic look, but only ever so slightly. The Kamacho performs really well as an off-road. This, of course, means it’s practically worth nothing in a race, but then no one expects a vehicle like this to be used for racing in the first place. High clearance and 50/50 torque allow it to crest just about anything, leaving few places across the GTA Online map where this beast can’t go. It’s also incredibly durable and can be upgraded with bullbars. The Kamacho’s is also a nice little treat. This good-looking 4×4 ride costs a measly GTA$ 345,000, which compared to the prices of some of the other recently released vehicles is mere pocket change. While you won’t use this car to rocket to the top of the leaderboards (considering that even with the best vehicles, chances are that you’re not the best racer out there) something that can get you anywhere in the game offers more value, especially for so cheap. As for the event we mentioned above, it’s Battle Week in GTA Online through the 12th of February. Rockstar put a double RP and GTA$ promotion on 4 Adversary Modes, which just might be a record. Playing Slashers, Motor Wars, Occupy or the new Hardest Target will net you twice as much cash and reputation as usual. This theme of battle and warfare extends into the realm of discounts as well, with most items on sale having some utility when it comes to making people not be alive anymore. Rockstar is also varying the rate of discounts, so not everything is 25% off for a change. One of the most important discounts on offer is the Mammoth Avenger, the flying fortress introduced in The Doomsday Heist which functions a lot like a MOC, but in the air. This beast of a vehicle is outfitted with weapons customization stations among a bunch of other goodies and is 25% off for the week. The HVY Chernobog, another heavy-hitting military vehicle, is also discounted by the same percentage. The Vom-Feuer AA trailer ramps things up to 35% off, while both the Half-Trak and Weaponized Tampa are 40% off. Weaponized vehicles are one thing, but sometimes your preferred method of offing someone needs to fit into your hands. The top of the line weapons are those tricked out with MKII upgrades, and these devastating gun mods are on offer as well. Magazines, Scopes, Liveries and Muzzles are all 25% off, the cost to upgrade a weapon to MKII status is 30% off and the price of all MKII ammo has been halved. 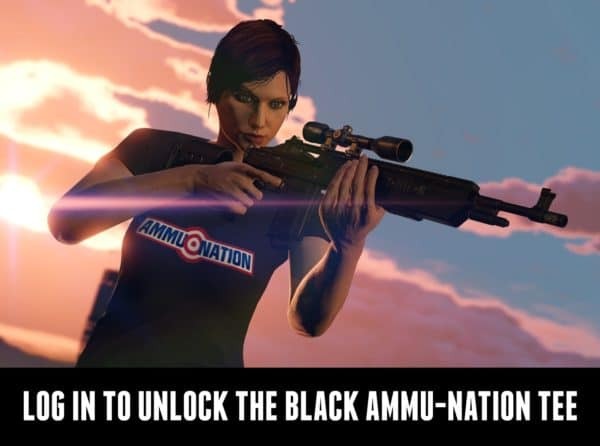 For less specialized combat needs, Ammu-Nation has a bunch of discounts as well. Body Armor, Melee Weapons, Assault Rifles, Sniper Rifles and the RPG are all 30% off, while the price of all ammo has been halved. Additionally, if you’re looking to upgrade your military planes, there is a 30% discount on all aircraft weaponry in the Hangar Workshop, allowing you to make sure your armada packs a punch. In case you’re in need of ground reinforcements, the Security Room upgrade for Facilities, allowing you to call in mercs, is 25% off. Rockstar also brought back the log-in clothing reward, which this time around is a Ammunation tee, in line with the discounts. This week’s event is a lot more engaging and interesting than the ones we’ve been getting for the past year, with a unified theme and wider scope. Hopefully Rockstar intends this to be the new weekly format, with every event being a “Something Week” tying the double rewards promos together with the discounts, and maybe even with the DLC vehicles, though that isn’t the case this week. Wait and see!